Cambodia is more than just temples. 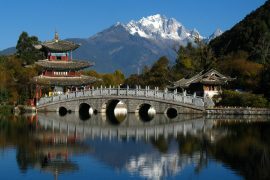 It’s a country of great natural beauty, with vast rice paddies, dazzling tropical islands, and mountains blanketed by lush rainforest. It’s a country with a long and sometimes painful history. 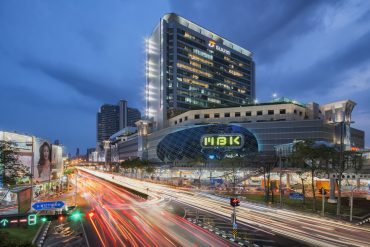 It’s a developing country and a developing tourist destination, still retaining the “authenticity” that some tourist spots in neighboring Thailand have largely lost. And it’s a great combination of friendly yet rough around the edges. If you’re planning a trip to the Kingdom of Cambodia, be sure to visit the following places. You may have heard of the grandeur of Angkor Wat or seen photos of the sun rising behind it, outlining its five central towers. You might have heard about the dozens of other temples in the area, their beautiful, ancient structures still standing strong in the jungle. Indeed, there has been a lot of praise for these sites, but do they live up to expectations? In short, yes. Believe the hype. The temples of Angkor truly are spectacular. They are one of those unique places that you can go back to multiple times and still be awed each visit. Aside from their sheer magnificence, one of the greatest things about the temples of Angkor is that if you hit them at the right times, you can find yourself in a certain corner all alone. 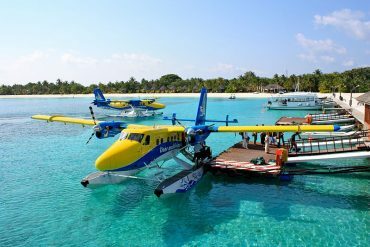 In fact, you can even go several minutes without seeing another tourist: a rarity and delight for such a major tourist destination, especially one this amazing. Visitors are also given relatively free rein on the grounds; you can climb ancient stairs, duck through little doorways, and sit on the edge of a building, your brand new sneakers dangling next to an almost 800-year-old wall. The crown jewel of Angkor’s temples is Angkor Wat. 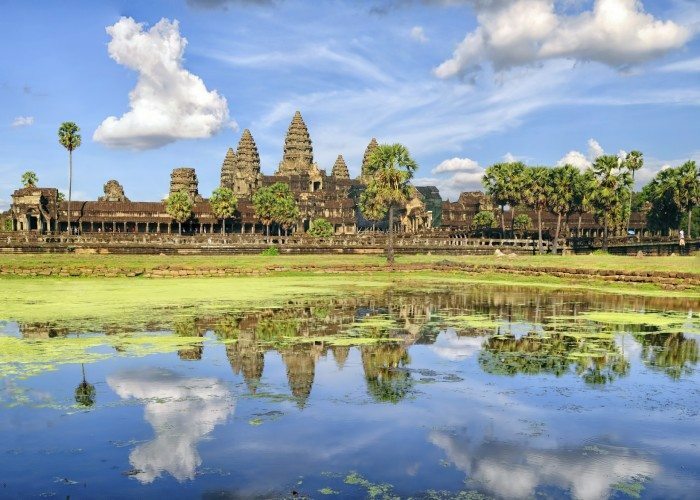 Built in the 12th century during the reign of Suryavarman II, Angkor Wat was originally a Hindu temple dedicated to Vishnu, but became a Buddhist temple at the end of the 12th century. Angkor Wat is the largest religious monument in the world and known for its splendor, the harmony of its design, its incredible bas reliefs, and the thousands of apsaras, or divine nymphs, that decorate its walls. Give yourself at least three hours to explore the temple grounds (though three days would be better). There are experienced tour guides who speak a number of languages. You have the option of arriving before sunrise or throughout the day. Keep in mind it gets very hot there at certain times of the year, so early mornings are better if you want to escape the worst of the heat. 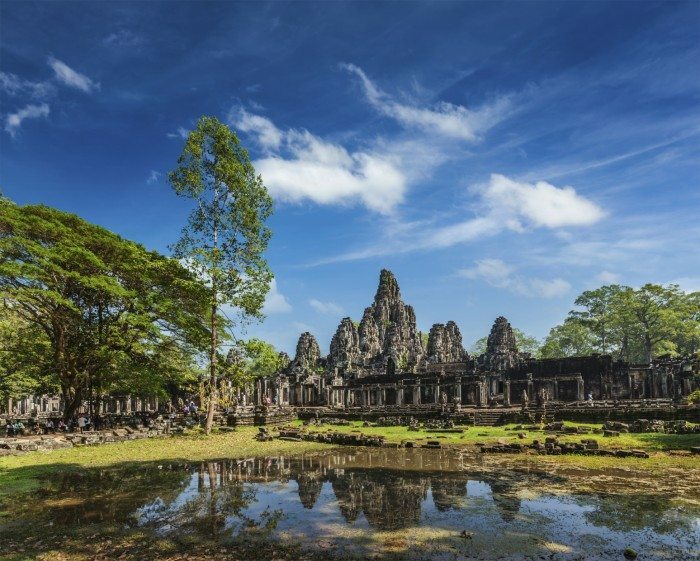 While smaller in scale than Angkor Wat, the other temples in Angkor, particularly Bayon and Ta Prohm, are also must-sees. Situated in the heart of Angkor Thom, near Angkor Wat, Bayon is known for the 216 giant smiling faces that are carved into stone. Because of its orientation, it’s best to visit Bayon in the early morning or late afternoon. Wander through Ta Prohm and feel like a modern Indiana Jones. 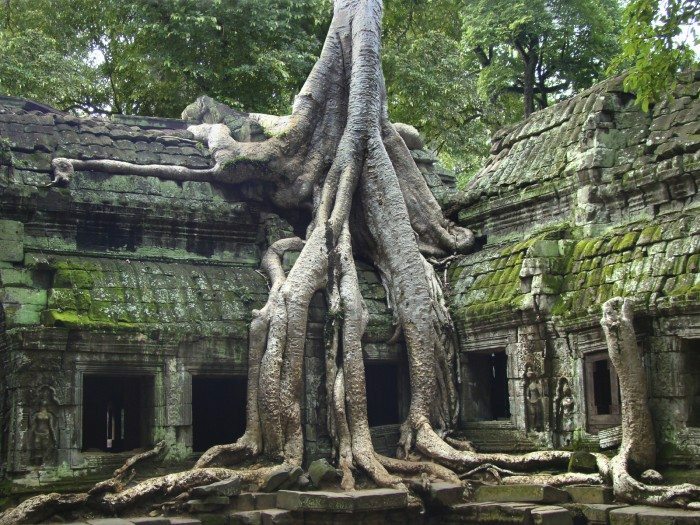 Ta Prohm is known for the tree roots that have enveloped the temple’s crumbling structures like woody tentacles. There is a real magic about Ta Prohm; it’s like a fantastical children’s book come to life or the kind of place you find yourself in a dream, only you’re awake. And very sweaty. While most people stay in Siem Reap as a base from which to explore the Angkor temples, it is a worthwhile city to explore on its own. 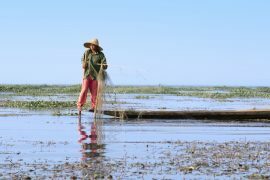 You won’t necessarily get an authentic Cambodian experience, but you’ll be comfortable and there are things to do. 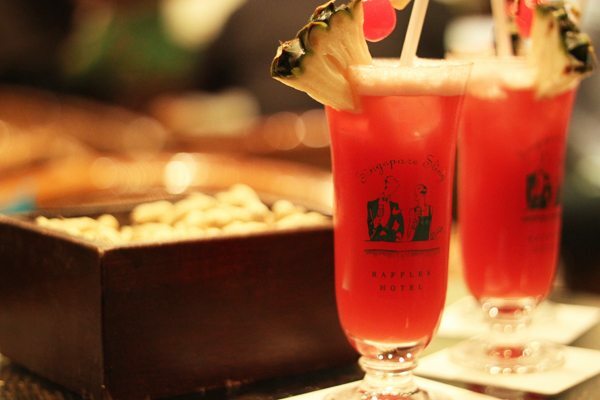 In terms of accommodation, there are a wide range of options, from backpacker hostels to 5-star hotels. Much of the tourist action centers around Pub Street; the name should give you an idea of the atmosphere and offerings there, but it’s a lively place to check out. While in Siem Reap, consider stopping by the Angkor National Museum or Angkor Silk Farm, seeing an Apsara dance performance, or taking a tour or class at Backstreet Academy. Visiting the Genocide Museum is, of course, not an uplifting experience. But it is incredibly powerful and moving, and something you should strongly consider doing when you’re in Phnom Penh. 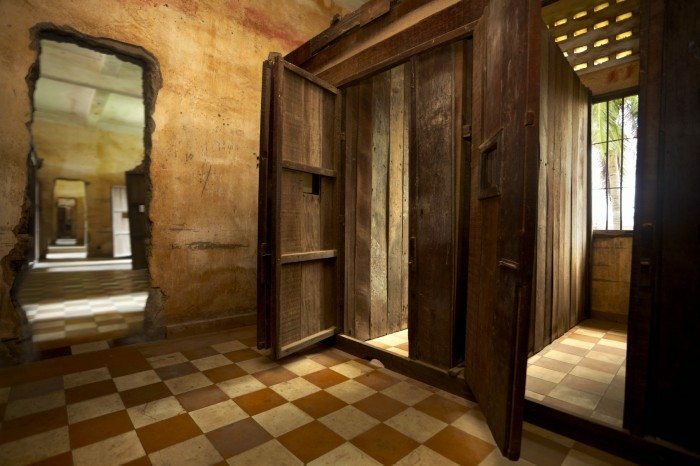 Tuol Sleng is a former high school which became Security Prison 21 (S-21) during the time of the Khmer Rouge. It was a place of unspeakable atrocities, where thousands were imprisoned and tortured. The museum offers a fantastic audio tour; most visitors walk around with headphones, observing everything in silence, which allows you to experience the site with the reverence it deserves. Be prepared for an emotional experience, but an important one. 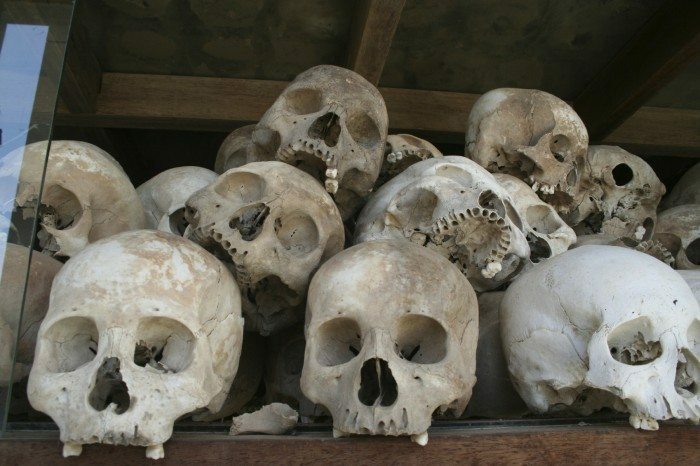 Consider going to the Killing Fields after you go to the Genocide Museum. Drivers and tours will often do both in the same day. Prepare yourself for the same emotionally devastating, humanity-questioning experience as Tuol Sleng. Like Tuol Sleng, it feels almost like a pilgrimage; a show of respect for the two million who lost their lives, and a place to gain some insight into the recent history—and resilience—of Cambodia. 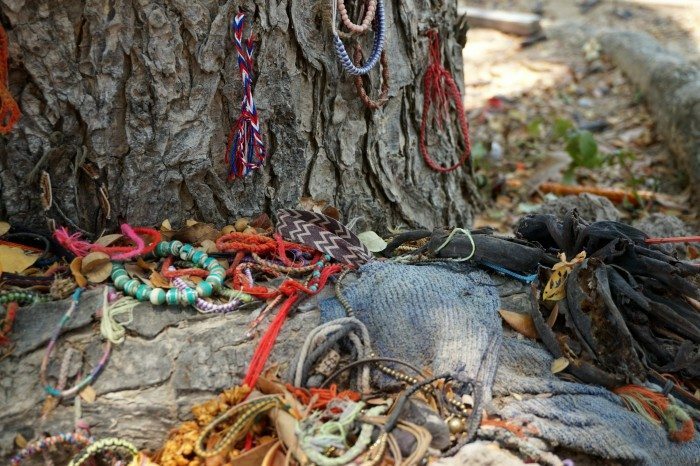 Killing Fields in Cambodia by Whitney C.
Cambodia offers some of the most stunning natural scenery in the world, and you can immerse yourself in it in the Koh Kong Conversation Corridor. This alliterative region sits in the southwestern part of the country, stretching from Koh Kong to the Gulf of Kompong Som. The Conservation Corridor includes the southern end of the Cardamom Mountains, which is the second-largest virgin rainforest on mainland Cambodia. The Cardamoms are known for their incredible beauty and biodiversity; tigers, Asian elephants, Siamese crocodiles, bears, and multiple species of tortoise and turtle all call the Cardamom Mountains home. Unfortunately, Cambodia also has one of the highest rates of deforestation in the world. In 1970, Cambodia had 70% primary rainforest cover, but that plummeted to a mere 3.1% in 2014. If you want to see Cambodia’s forests, time is of the essence. In the Conservation Corridor, visitors can do a trek from anywhere from one to seven days, go on an eco tour, visit a wildlife release station, or swim at Tatai Waterfall. 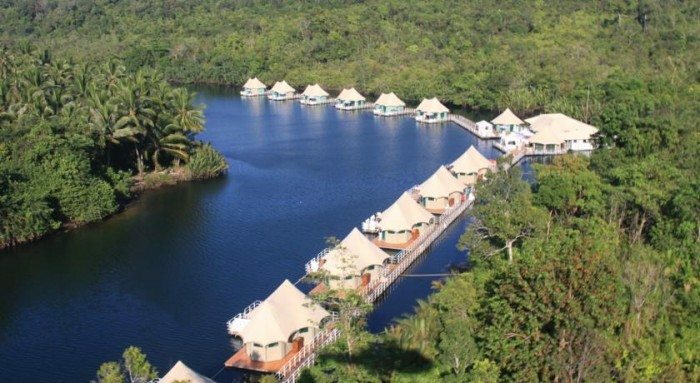 Consider staying at the fantastic 4 Rivers Floating Lodge or Oasis Bungalow Resort. Tropical beaches might not be what pops into your head when thinking of Cambodia, but visitors will be pleasantly surprised to discover enviable stretches of sand and turquoise water off Cambodia’s coast. Koh Rong is an island located 45 minutes by speedboat from Sihanoukville and is said to have some of the best beaches in the country. 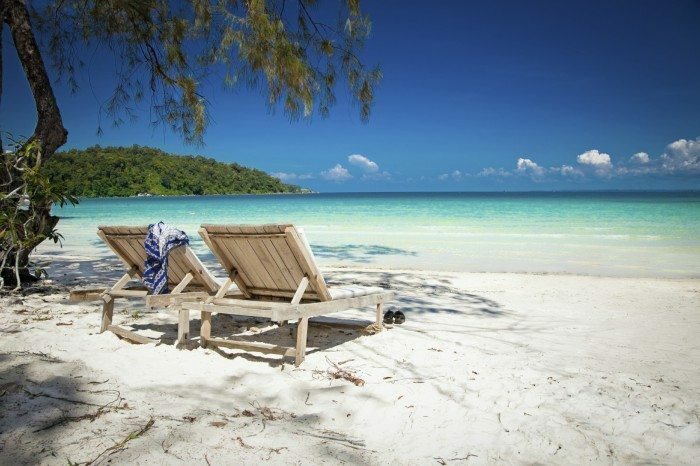 Although Koh Rong has a reputation as a party island with a large backpacker crowd you can easily avoid the scene by grabbing a boat from the main pier or taking a trek through the jungle to access Southwestern Beach or Long Set Beach for glistening white sands and a secluded laid back stay. Accommodation on Koh Rong is limited to mainly simple budget hotels and guest houses with the exception of Song Saa Private Island Resort, this luxurious private resort with a hefty price tag spans over two idyllic islands just off Koh Rong. Last but not least, you may want to add Battambang to your Cambodia itinerary. 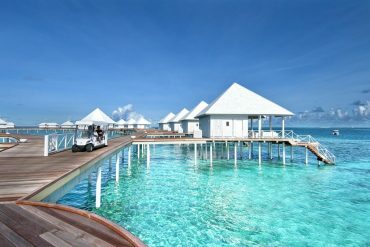 Despite the fact that there isn’t much to do there, it has a charm that continues to draw visitors. 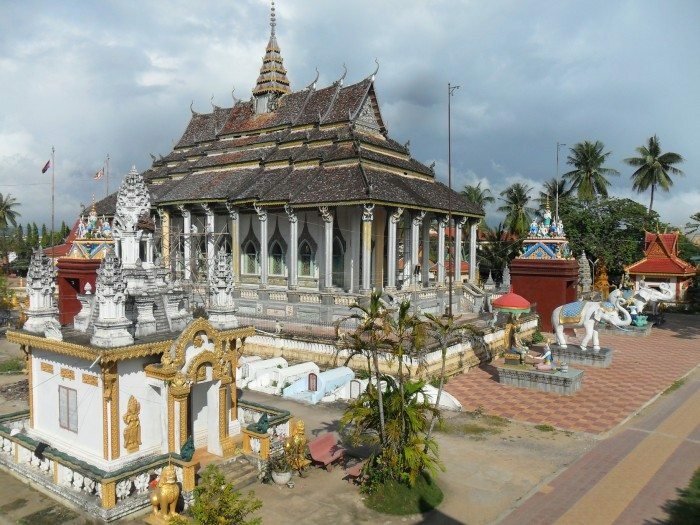 Located in northwest Cambodia, the city of Battambang sits near the Sangkae River and is filled with colorful, weathered French colonial buildings. The city has some fantastic restaurants and cafés, as well as a flourishing contemporary art scene. 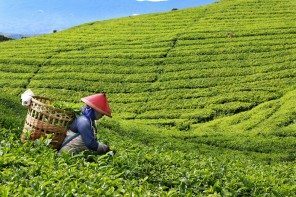 Ride the famous bamboo train, explore the bat caves, and take in a wonderful performance by the young people of Phare Ponleu Selpak.